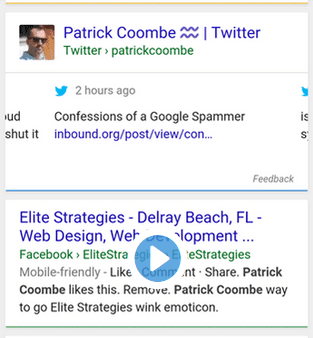 By now I’m sure that you’ve heard the news: Google is indexing and displaying Tweets in Google. A few months back they began displaying them in mobile results, and now they are displaying them in desktop as well. Haha! Just kidding 🙂 It’s gonna be a little harder than that. In fact, this really is not something that you are able to control. This post really is all about increasing the odds of getting your tweets displayed in Google search results. While it isn’t easy to contol many of these aspects such as the age of your Twitter account or the amount of inbound links, it is quite easy to control your structured data. Personally I believe that this is one of the main factors for getting your tweets indexed in Google. Make sure that all of your information “matches” to a degree. For instance make sure that your name on Twitter matches the name on your website. Other factors that might contribute to this is your overall brand name keyword density, your URL, your Twitter account handle and other markup. The above values can generally be used safely sitewide if you are a single site, single author. If you have a multi-author blog you’ll have to adjust these. Sadly, my tweets are not showing up in Google search. At one point they were showing up in mobile but for some reason dropped out. It could be that my account just doesn’t have enough authority or I changed something in my structured data, which I am constantly playing with. Either way, if you’ve got an authoratative account and have your settings properly configured I see no reason why you shouldn’t get your Tweets indexed in Google. Also note: remember Google rolls out updates in stages. For instance when Google first started showing social network links in the search results, they began by only showing results for Hollywood A-listers and celebs. As the months went on they started giving them to regular people. That’s right, it took months for that to roll out so if you are worried about getting your tweets in Google it might take some time.